There were several important reports on the U.S. economy released this morning. 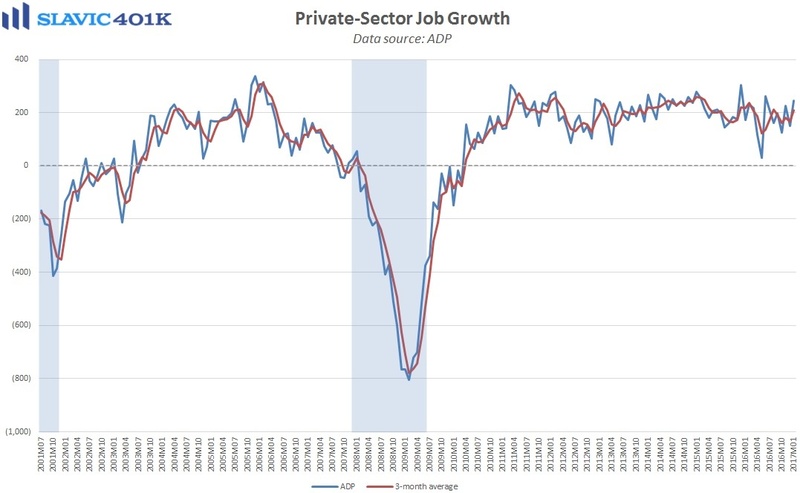 First, data from ADP showed that business hiring rebounded in America last month, with 246K private-sector payrolls being added to the economy. That was a sharp improvement from the 151K gain seen in December and much better than economists had expected. The less volatile 3-month average for ADP’s hiring estimate rose to +208K in January, the highest reading since August. 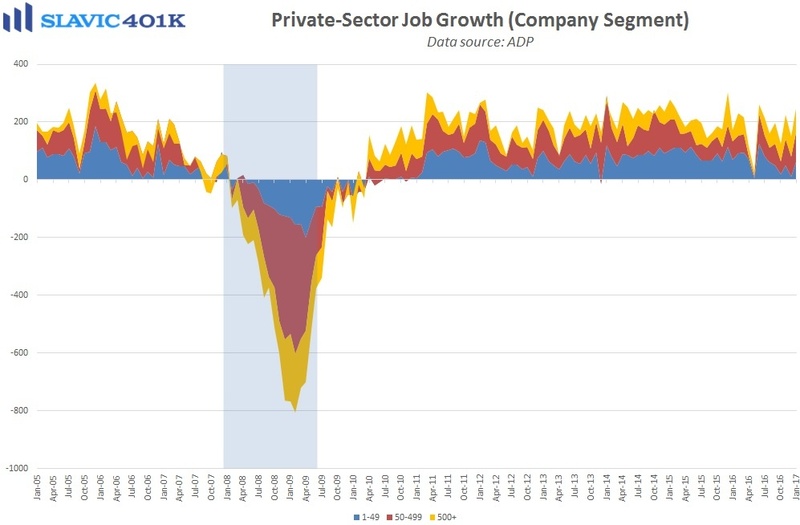 Under the hood, most of the private-sector payrolls added last month were in the services sector (+201K), including large gains in the “trade, transportation & utilities,” “professional & business,” and “education & health” arenas. Payrolls in the goods-producing sector experienced a net gain of 46K jobs in January, the largest monthly increase in two years. 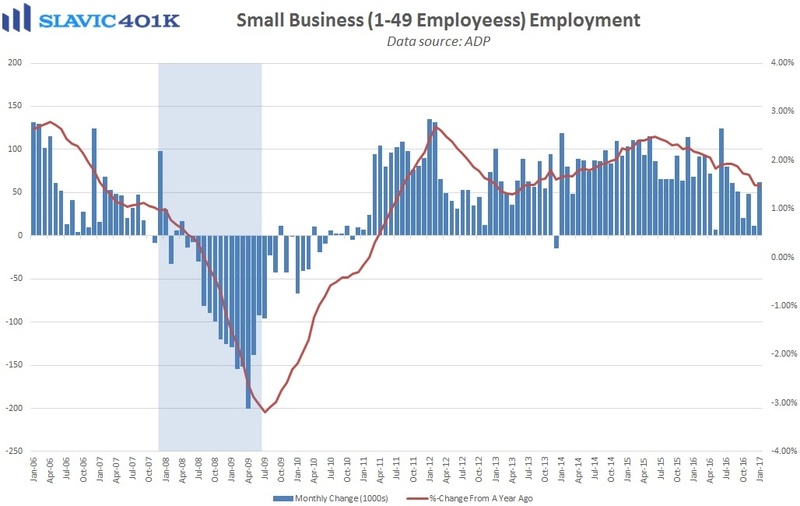 Elsewhere in the report, small business hiring jumped to 62K payrolls in January, a rebound of 50K and the highest monthly reading since July. Mark Zandi, chief economist of Moody’s Analytics, added that “2017 got off to a strong start in the job market. Job growth is solid across most industries and company sizes. Even the energy sector is adding to payrolls again.” However, it is worth noting that although this is an encouraging data point, the ADP report is not always predictive of the more important monthly job report from the Bureau of Labor Statistics (BLS), due out this Friday. 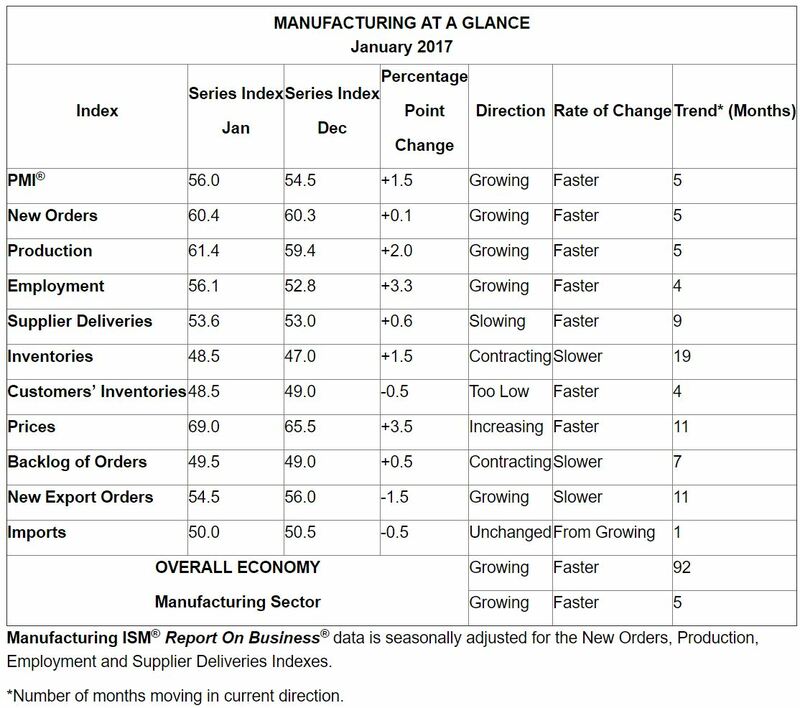 Next, the manufacturing purchasing managers' index (PMI) from IHS Markit ended January at 55.0, the best headline reading since March 2015. Under the hood, output volumes continued to expand and new order growth accelerated to a 28-month high. Surveyed managers cited “an improved economic backdrop and a corresponding rise in clients’ willingness to spend” as reasons for the stronger order books. However, respondents also indicated that cost pressures intensified in January, with input prices rising at the fastest pace since September 2014. 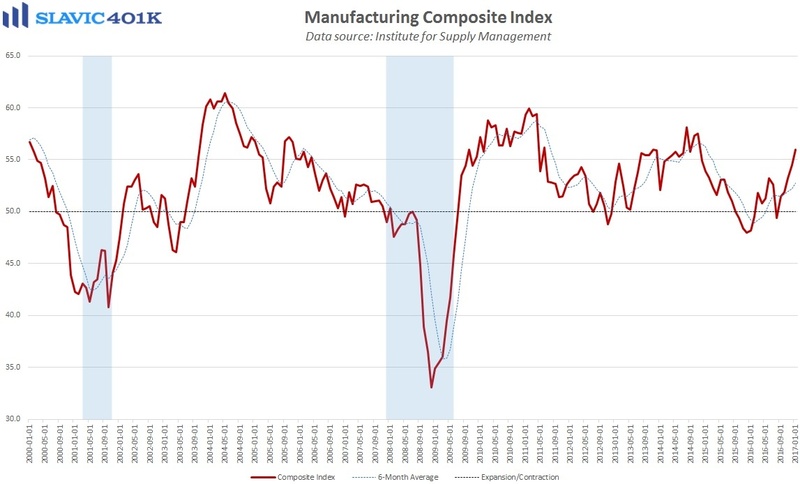 Chris Williamson, chief business economist at IHS Markit, added that “all of the survey indicators point to the Fed hiking interest rates again soon.” Similarly, the Institute for Supply Management (ISM) manufacturing index, also released this morning, jumped to 56.0 in January, much better than expected and the highest reading since 2014. Measures of new orders, production, and employment all improved last month but inflation spiked and exports fell. Comments from surveyed managers were generally positive. 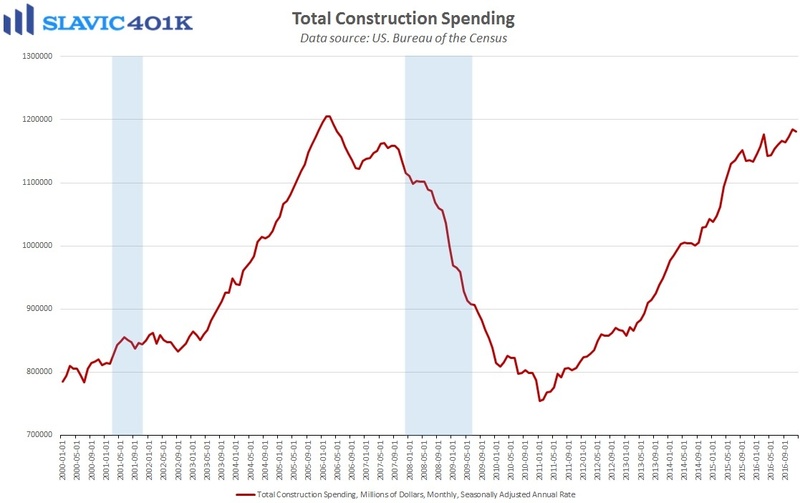 Elsewhere, a report from the U.S. Census Bureau showed that construction spending in America grew at an adjusted annual rate of $1,181.5 billion in December (lagged release). That was a decrease of 0.2 percent from November’s downward-revised print and much worse than the 0.2 percent gain economists had anticipated. December’s decline pulled year-over-year growth down to 4.2 percent, albeit still the 2nd-best annual growth rate recorded since April. 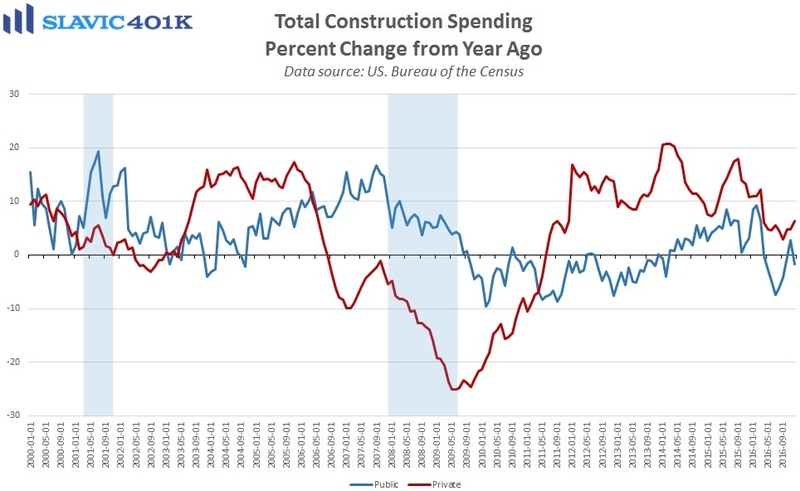 Private-sector construction spending firmed in December while growth in the public-sector softened.